Tariffs on aluminium and steel would be damaging enough, but an expansion to passenger vehicles would affect a large share of EU car exports to the US. By Mahdi Ghodsi, Richard Grieveson, Julia Grübler, Mario Holzner, Olga Pindyuk, Robert Stehrer, and Roman Stöllinger. The net outcome of the new tariffs will be a loss for the global economy. Due to their exemption, Canadian producers will be the clear winner in terms of welfare effects, while US consumers will be the clear losers. European consumers will gain, while producers will lose. An escalation into a full-scale trade war, for example with higher US tariffs on EU passenger vehicles, is possible. This would be much more damaging for Europe. An increase in US tariffs on EU car imports to 35% (as previously threatened by US President Donald Trump in relation to Germany) would cause a sharp reduction in EU autos exports to the US. US President Donald Trump has proposed new tariffs on imports to the US: 25% on steel and 10% on aluminium. NAFTA countries are set to be exempted. Mr Trump has said that the protection for US industries will last “for a long time”. Gary Cohn, Director of the National Economic Council, has already resigned over the issue, and Congressional Republicans are opposed. Nevertheless, it appears that Mr Trump intends to go ahead. The proposed tariffs are a significant increase on current levels. Since 2004 all US tariffs on imports of steel have been set to zero, while since 1996, tariffs on imports of aluminium have been around 2.5% (for aluminium the trade-weighted tariff is smaller than the simple average tariff, which indicates that smaller tariffs were imposed against larger trade flows to reduce the costs of imports). The consequences are very difficult to predict. 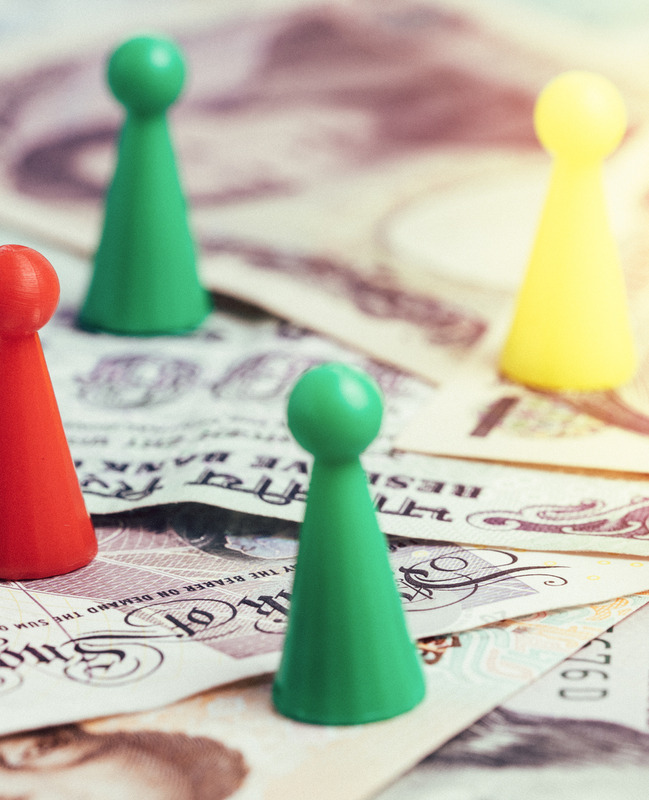 Quantifying the outcome is difficult at this stage with standard trade models, and will depend on counter-measures by the EU and other US trade partners. Moreover, steel and aluminium are intermediate inputs in many other products, meaning that entire global trade and production networks will be affected. What appears clear, however, is that the imposition of new tariffs, and (likely) counter-measures by trade partners, will hurt most or all parties involved. Most economic studies point to modest overall gains from trade for both partners, while an increase in tariffs (or less standardisation) leads to overall welfare losses for all. The gains and losses are certainly not uniform across the economy; final consumers tend to lose because they face higher prices, while domestic producers gain, because they can sell their products at a higher price. In addition, the country earns some tariff revenues. However, under standard assumptions on the reaction of supply and demand on price changes (demand and supply ‘elasticities’), on a net basis the losses outweigh the gains, and the tariff-imposing country faces a ‘dead-weight loss’. US imports of iron and steel are not significant as a share of global production, and therefore prices for both metals may not be materially affected by the tariffs. Although the US is the world’s biggest importer of both pig iron and iron products, these imports account for only 0.3% and 2%, respectively, of world production. Moreover, while US production will likely rise after the tariffs come into effect, the US’ small share in global production will limit the impact. US production accounts for less than 2% of global production in the case of pig iron and 4.8% in the case of crude steel. Hence, even if steel production in the US is very inefficient (and hence more expensive), the effect on global prices will be minor. This is even more likely given that the iron and steel markets are supposedly plagued by overcapacity (for which China is mainly blamed). 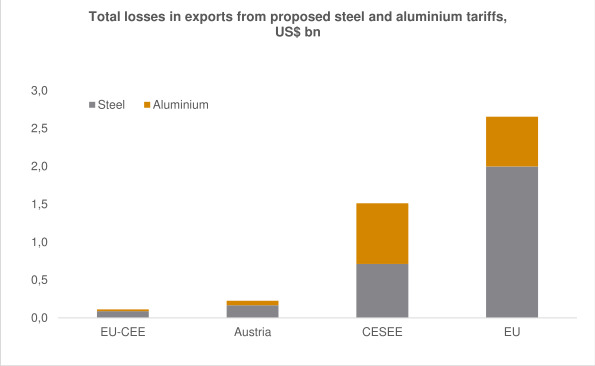 The impact on the EU, Austria and CESEE countries of the rise in tariffs on steel and aluminium will be limited. Iron, aluminium and associated products represent only around 0.2% of total exports for all EU and CESEE countries. Within the EU, the highest levels are for the Netherlands and Ireland, although even here the share is only slightly above 1% of total exports. In CESEE, the most exposed countries are Russia (0.8% of total exports), Ukraine (0.6%) and Turkey (0.6%). EU28: US$ 2.7bn. (Our result is close to that recently published by Chad Brown of the Peterson Institute for International Economics). In each case the project dollar value of the impact is negligible as a share of GDP. 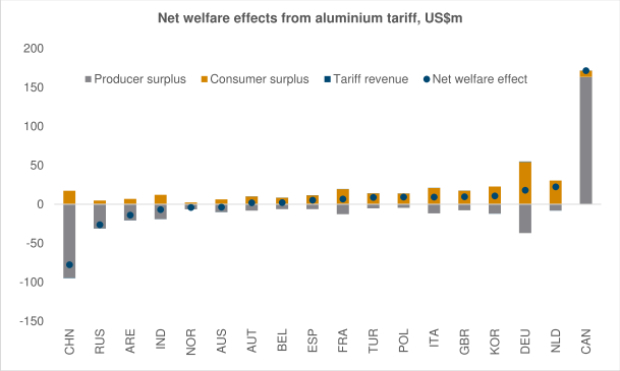 Our calculations on the overall welfare impact of the tariff changes indicate relatively significant changes for some countries (the net welfare impact takes into account the impact on the producer surplus, consumer surplus, tariff revenue and changes in subsidy payments). Using partial-equilibrium simulations, we find that the US will be the clear loser: we estimate a net welfare loss of US$ 2.3bn in steel and US$ 233m for aluminium. At least in the short run, US producers will not be able to profit from the tariff protection, as prices will drop in the their main export markets. Moreover, US consumers will lose because of the tariff-induced increase in import prices. In the case of steel, owing to its exemption, Canada will be the clear winner, both in terms of rising output and the related welfare gains of Canadian steel producers (+US$ 494m). Other major global steel producers—including Japan, China, Brazil, Korea, and Taiwan—will lose, but the net losses will be in the range of US$ 100-300m, all small shares of GDP (see chart below). 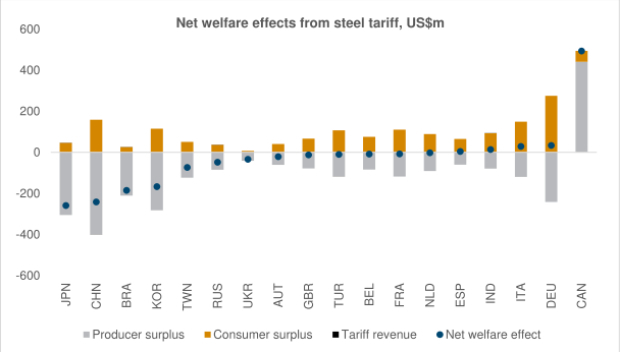 None of the European economies that we looked at will experience significant net welfare gains or losses in the case of steel. In general, producers will lose (on average around US$ 100m for the European countries studied), while consumers will gain (on average around US$ 90m). The general trends in aluminium will be similar: Canada would again be the main winner, while China would be the main loser. Overall producers will lose (except in Canada) and consumers gain. Overall European countries will only see quite small net welfare effects, with the Netherlands and Germany doing best, and Russia suffering the most. It is possible that these assumptions underestimate the impact, however. Using a partial equilibrium model means that we do not fully capture inter-sectoral linkages and global value chains. Taking into account these effects would probably produce higher estimates of net welfare changes, particularly in the case of the US. While the proposed tariffs on steel and aluminium would therefore only have a minor impact on Europe, the potential expansion to a full-scale trade war would be much more damaging. It is possible that many countries will take matters into their own hands. The European Commission has prepared a provisional list of products. Cecilia Malmström, the EU’s trade commissioner, has threated counter-measures if the US goes ahead. Meanwhile Jean-Claude Juncker, President of the Commission, warned on possible counter-measures against motorbikes, clothing and whiskey. If events take this course, it is possible that the US will retaliate, including following through on Mr Trump’s earlier threat to increase tariffs on German car imports to 35%. This would have a much bigger impact on Europe. The current US tariff on passenger cars from the EU is just 2.5% (the tariff for vans and trucks is a much steeper 25%). Among European countries, the direct effects of a 35% US tariff on EU autos exports would fall most heavily on the EU15. German vehicle exports to the US amount to 2.7% of its overall exports, 28% of its total exports to the US and 15% of its worldwide vehicle exports. Austria (0.7% of total exports are vehicle sales to the US), France (1.8%) and the UK (1.2%) would also be badly affected. Within EU-CEE, in terms of direct effects, the hardest hit would be Hungary (1%) and Slovakia (1.3%). Within non-EU CESEE, Serbia (0.7%) and Turkey (0.5%) would be most affected. Moreover, for CESEE, focusing only on these direct effects significantly understates the extent of the impact. Many countries in the region are heavily integrated into the production and supply chain of the German car industry in particular. The Czech Republic, for example, exports more than one quarter of its GDP to Germany. CESEE includes many very open economies which would be badly affected by big disruptions to global trade.